A comprehensive support for optimum adrenal function, here is Phyto-ADR by Pure Encapsulations. 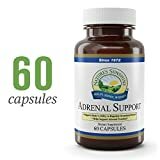 Adrenal Support - 180 Vegetarian Capsules, Vitamin, Ribo_avin (Vitamin B-2), Vitamin B-6, Pantothenic Acid, Eleuthero, American Ginseng, Ashwagandha, Rhodiola Rosea, N-Acetyl L-Tyrosine, Licorice. 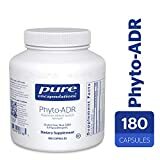 Phyto-ADR by Pure Encapsulations is a high-quality popular supplement that helps in the Mood Support, Boosts Energy, and Support Hormone and includes vitamins. Read on to know more about the Pure Encapsulations Phyto-ADR Review. 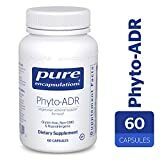 Pure Encapsulations Phyto-ADR is a plant-based formula that provides support for the adrenal glands and the body’s response to occasional stress. It attempts to offer comprehensive help for healthy adrenal function. Healthy adrenal gland function is critical for a number of physiological functions such as glucose metabolism, stress adaptation, energy generation, stamina, and the immune response. This is a vegetarian formula designed to provide wide-range herbal and nutritional support for the adrenal glands and healthy adrenal function. It provides complete support for healthy adrenal function. This vegetarian formula contains many herbal and nutritional ingredients to support adrenal glands. Panax ginseng and Eleutherococcus senticosus, or eleuthero are extremely recognized adaptogens that promote physiological balance and resistance to stress. As a part, they may help to moderate the production of adrenocorticotrophic hormone (ACTH) and ultimately corticosterone activity. Corticosterone encourages the conversion of amino acids into carbohydrates and glycogen by the liver. It also stimulates glycogen formation in the tissues, supporting optimal energy reserves. Rhodiola Rosea contains rosavin’s and salidroside that act to balance hypothalamic-pituitary-adrenal activity. It also has a calming effect on the central nervous system and supports healthy thyroid, thymus, and adrenal gland function. Particularly, Rhodiola may moderate the effects of physical and emotional stress. Astragalus and ashwagandha could improve immune support and complement the adaptogenic activity of this formula. Calcium pantothenate, a vitamin B5 derivative, is essential for stimulating the adrenals. Collectively, all these ingredients support the health and activity of the adrenal glands. It contains many ingredients and their sources are – Calcium pantothenate (vitamin B5 derivative) is synthetic. Panax ginseng extract derives from the root and standardized to contain ginsenosides. Eleutherococcus senticosus extract obtained from the root and standardized to contain eleuthero side E & B. Ashwagandha extract from Withania somniferous and standardized to contain withanolides. Rhodiola Rosea extracts from the root and standardized to contain rosavin’s and min. Astragalus membranaceus extract (8:1) from the root. Ascorbyl palmitate derived from corn dextrose fermentation and palm oil. Hypo-allergenic plant fiber sourced from pine cellulose. Its other ingredients are a vegetarian capsule (cellulose, water). Take 1 capsule in a day, between meals, or as directed by a health professional. Pregnant or lactating women should not take this supplement. Some of its ingredients may cause adverse side effects. Panax ginseng or eleuthero may cause insomnia, fatigue, anxiety, headache, vertigo, and diarrhea or skin rash. These ingredients may also cause mastalgia, vaginal bleeding or amenorrhea. Moreover, Panax ginseng or eleuthero may relate with palpitations, tachycardia, or hypertension in individuals with cardiovascular disorders. Consult your doctor for more details. Pure Encapsulations Phyto-ADR may be contra-indicated with immune suppressants‚ benzodiazepines‚ sedative and thyroid medications. Panax ginseng and eleuthero may contraindicate with blood thinning and antihyperglycemic medications. 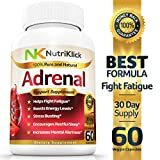 People say this is an excellent product for adrenal fatigue. This outstanding product works well and helps with energy levels. It has received 4.5 out of 5 stars on Amazon. Colleen’s doctor prescribed this supplement. It gives him more energy without any side effects. L.O. bought this as plant-based support for her adrenals and she feels it’s very effective. It even calms anxiety and keeps her more centered emotionally. As a side effect (a positive one), though she is not pretty sure this product is responsible for the clearest skin/ pores she ever had. Maybe because of the Pantothenic acid (vitamin B5) in Phyto-ADR, this in large doses is available in acne medications. Lee liked this product and had helped keep her energy level on an even keel. Unfortunately, in the second week, she notices painful breast tenderness. After looking at the ingredients she got to know about eleuthero which she had stopped before because of breast tenderness. If you are looking for a product which supports proper adrenal glands as well as improves energy levels and enhances mood, then this is a right product for you.